Apple pie, the 4th of July, fireworks in the sky, and front porches seem to all go together, right? What better way to celebrate Independence Day than with outdoor 4th of July decorating and entertaining. 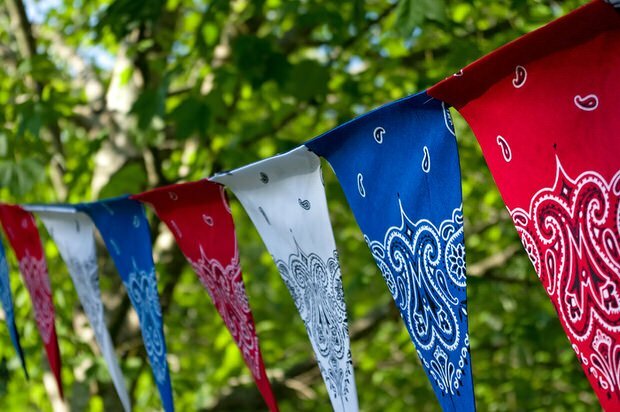 Try a few of these 4th of July outdoor decorations to create a patriotic front porch or yard in red, white and blue. These tutorials and Fourth of July crafts will help you make your outdoor space “explode” like fireworks! Start with Old Glory. Just make sure she doesn’t touch the ground or shrubs and that she is illuminated from dusk to dawn. Don’t have a flag holder? You can hang your flag vertically from your porch (make sure the stars are to the viewer’s left). Have a screened porch, 3-season, or four season porch? Hang the flag on a wall to create just the right look for this special day. Jennifer from ‘The Magic Brush‘ has a step by step tutorial for her 4th of July American flag project. She made this with an old pallet! This is a quaint way to add rustic charm to a Fourth of July celebration. 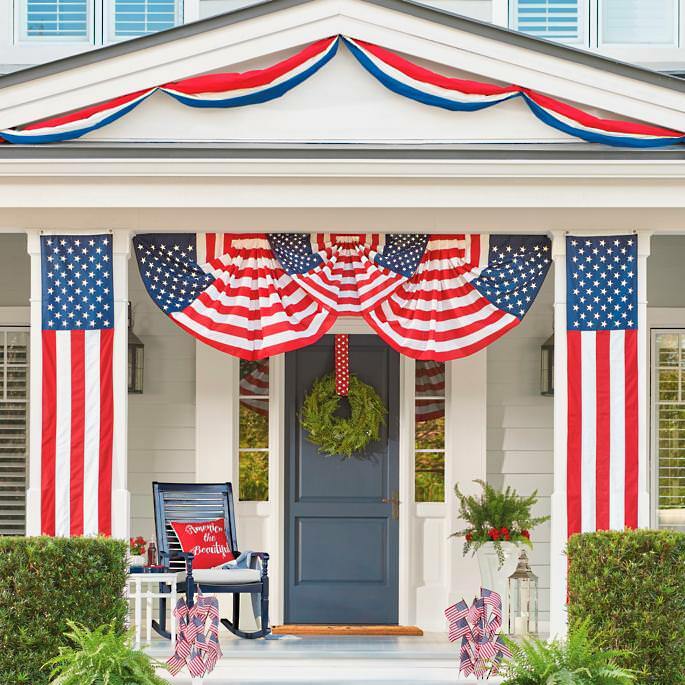 From ‘Lowe’s‘, here is an entire 4th of July front porch to copy! They have a tutorial for it all, from the “flag” art to the table top mini flag holders. They even have some ideas for a DIY Fourth of July yard game! 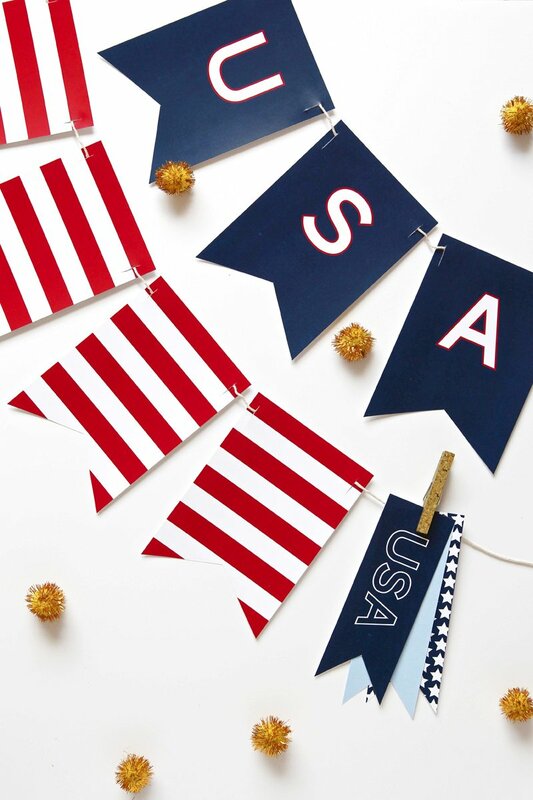 If you are looking for good ol’ fashioned homemade Fourth of July decorations, then try a DIY banner! 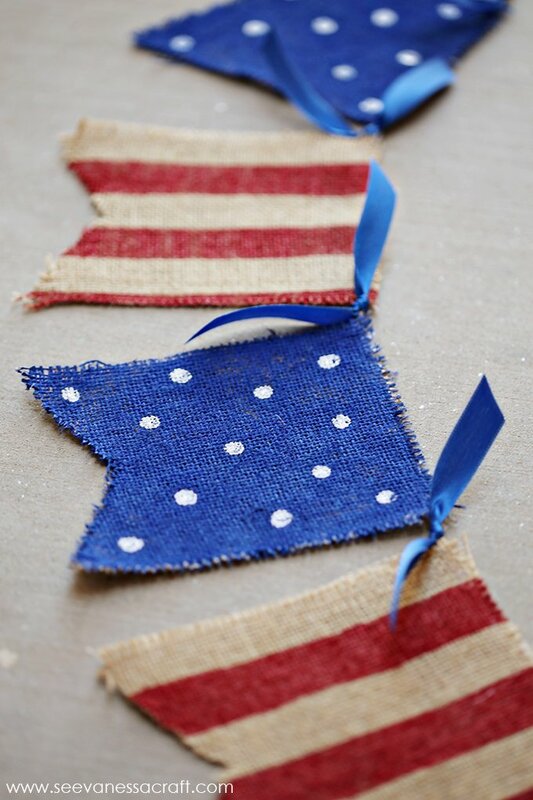 Attach patriotic bunting across the front of your porch, or hanging from the roof eaves. Try this painted burlap banner from ‘See Vanessa Craft‘. This is one of those Fourth of July decorating ideas you can do with your kids, but looks nice enough to save year after year! 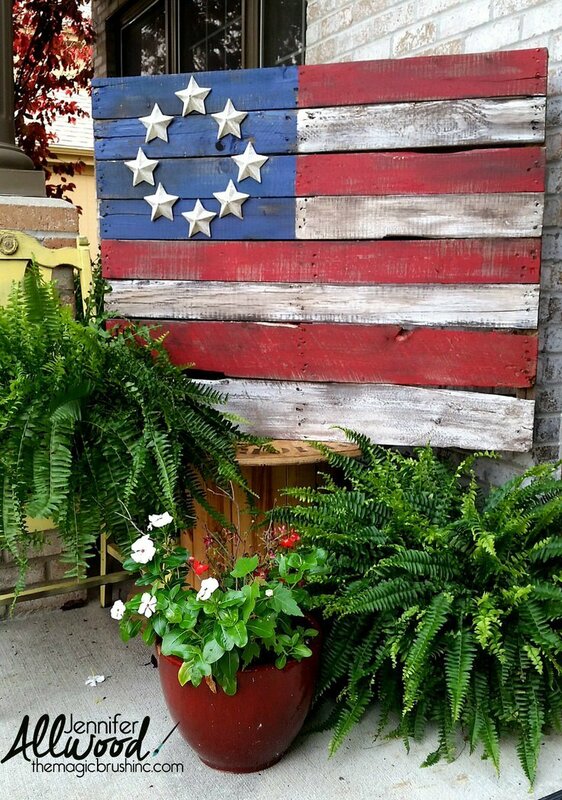 Want an even easier outdoor Fourth of July decorating project? Just print out this banner with the free printable from ‘Paging Supermom‘! 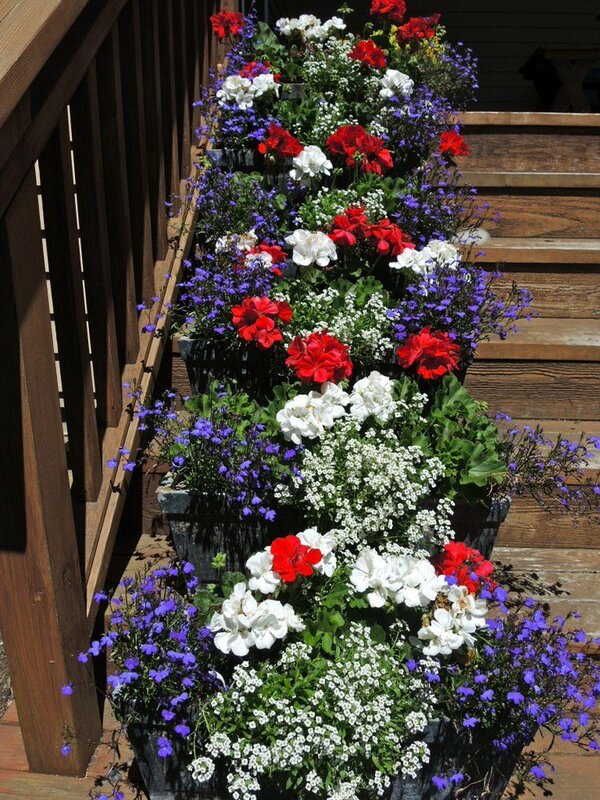 Plant red, white, and blue flowering plants in front of your porch. You can even arrange them in the shape and colors of the flag! Or, use the same color in plantings for hanging baskets. (Need help with that? Visit our post at TGG on How to Grow Hanging Baskets!) For red flowers try zinnias, petunias, salvias, begonias and geraniums. We suggest white petunias, white vinca or white impatiens for white blossoms. For blue flowers, purplish-blue petunias, blue lobelias, blue salvias and bluebells will do. These 4th of July planters from ‘Blueberry Hill Crafting‘ are the perfect example of easy flowers that can be planted for a patriotic display. These are geraniums, blue lobelia and white alyssum. Easy! 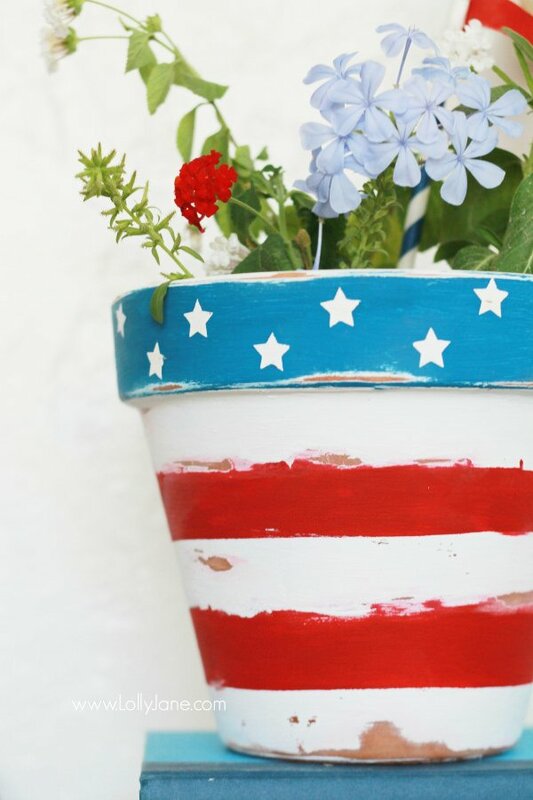 Try this stars & stripes patriotic pot DIY project from ‘Lolly Jane‘. All this takes it an inexpensive terra cotta pot and some craft paints! What a perfect 4th of July decorating idea. Don’t forget the lights! Decorate your porch with patriotic string light sets. You can hang them around the top of your porch or across the balusters. 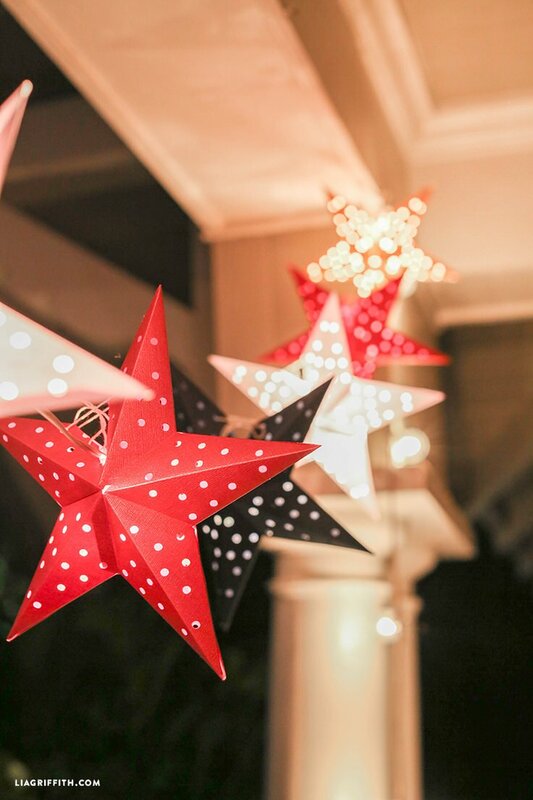 Try this DIY paper star light string from ‘Lia Griffith‘! Her tutorial for this Fourth of July craft even includes a free star template to make the paper star shapes! 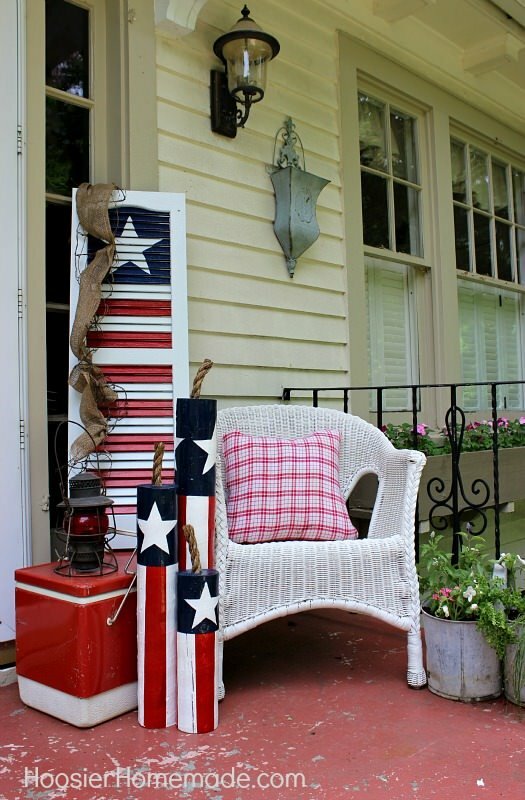 This kind of 4th of July decorating makes you want to stay outdoors long after the hot summer sun goes down! 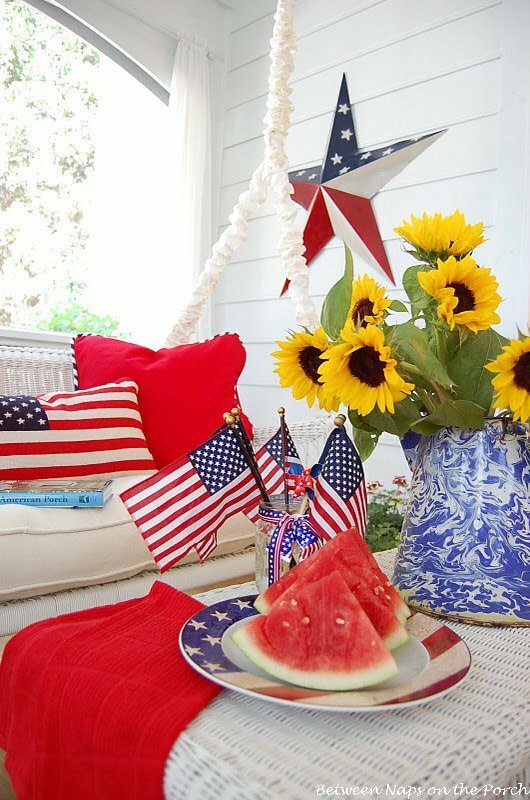 Decorate your front porch table with these great 4th of July decorating ideas from ‘Between Naps on the Porch‘. From using watermelon and sunflowers from the grocery store, to dollar store glasses and dime store glitter stars, she knows how to bring the old fashioned charm to her porch! So feel free to “steal” her amazing, and budget friendly ideas for Fourth of July decorating! 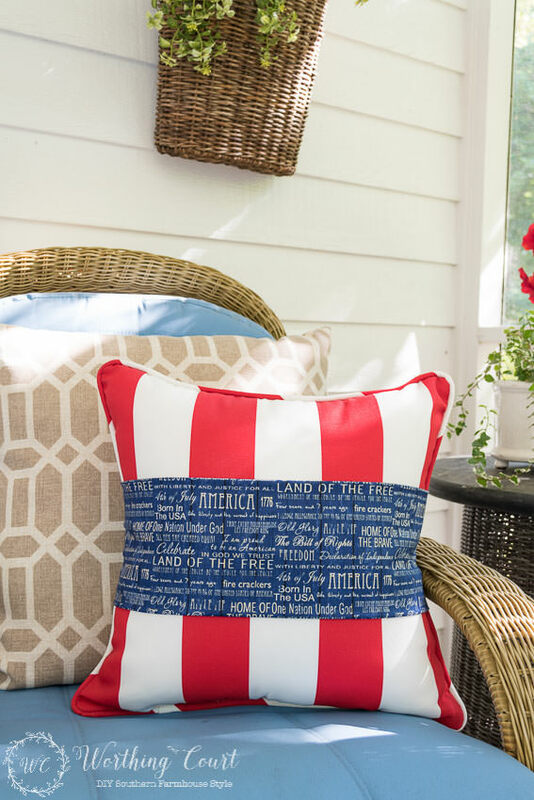 Make this patriotic porch pillow with an existing pillow and some novelty holiday fabric pinned around to the back. Could it get any easier? This is also a cheap 4th of July decorating idea. Simple! From ‘Worthing Court Blog‘. Our next project is a DIY bandana banner, perfect for the Fourth from ‘Life in Wonderland’. Bandanas are also really inexpensive, and this project was so easy! 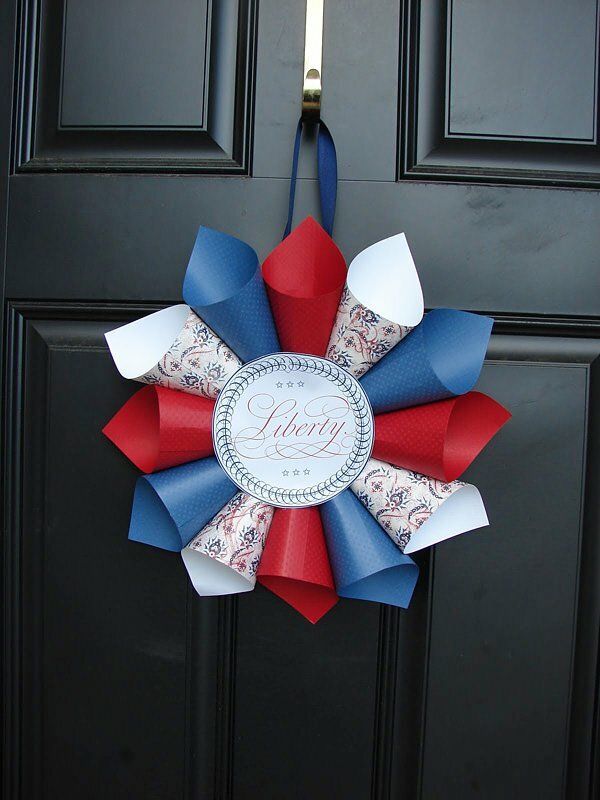 Make a patriotic door wreath. It can be very simple. Use a grape vine wreath and hot glue patriotic stars, flags, buttons, and ribbons on it. Don’t forget the porch chair cushions. You can make covers in red, white, and blue. Make an overlapping opening in the back so the pillow covers will slip off easily and save them for the next patriotic holiday. Try this patriotic door wreath by My Blessed Life, created from scrapbook paper and double sided tape! Hoosier Homemade has this tutorial on making these DIY wooden firecrackers for your front porch…a fresh take on the flag! 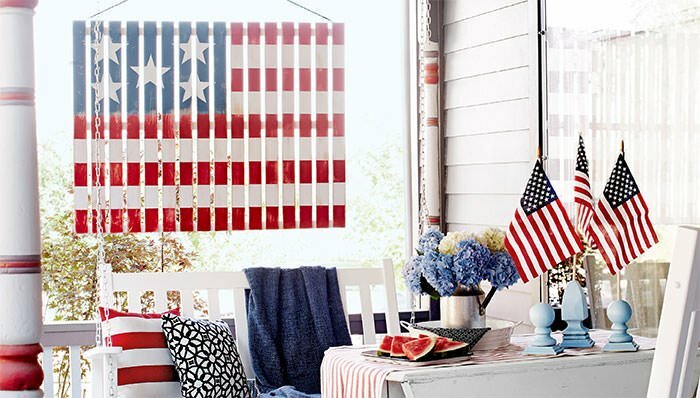 Finally, get inspired with this 4th of July decorating treasure trove of ideas! 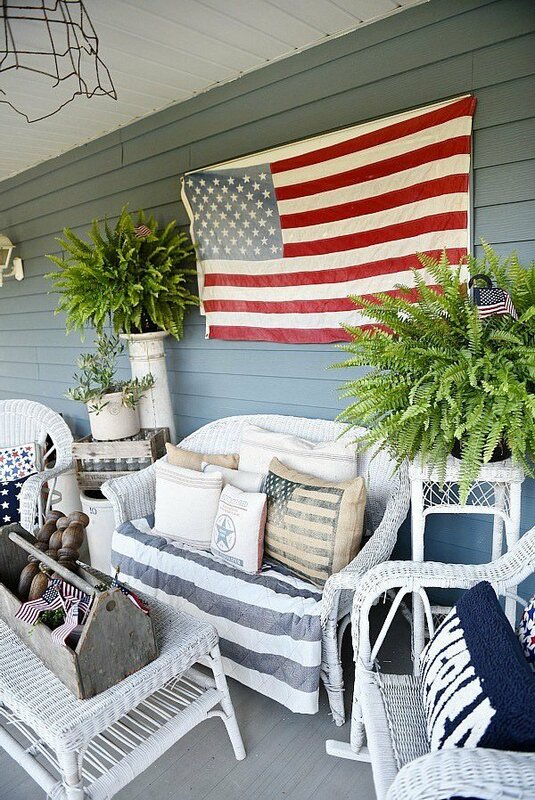 ‘Liz Marie‘ created the perfect Fourth of July outdoor porch celebration! She hung a flag on the wall, added some patriotic fabric covered pillows and a striped throw, and some little flags tucked into her centerpiece. Perfection! Memories are made on your front porch. This 4th of July, let your porch sizzle with fun! If you enjoyed our post on Front Porch & Outdoor 4th of July Decorating, we think you will want to jump right on over to Quick Fourth of July Decorating Ideas and DIY Stock Tank Pools!